The National Film Board of Canada played a pivotal role in building the Nova Scotian film industry, and nurturing generations of local filmmakers and storytellers. The entire catalogue of the NFB is available on-line, a remarkable act of foresightedness that is only vaguely appreciated. I recently came across a title, withdrawn by the time I was working in Halifax NFB HQ in the 1980s, that still sends shivers down my spine. It’s an hour-long examination of mass forms of modern competition around the world titled Of Man And Sport. Written by the great French Structuralist Roland Barthes, it has only recently been adapted into book form well after Barthes’ complete works were compiled. That particular film dates from 1960, some time after the NFB’s early glory days were past. Mind you, 1960 places the film near the institution’s infatuation with Cinéma vérité, a format they helped pioneer. The National Film Board was also among the first media organizations to voluntarily decentralize, a trend now followed in Western Europe and a number of other places around the world. The NFB’s Atlantic Centre didn’t simply make films. It offered support to indie movie-makers, providing a long-distance phone, meeting rooms, shipping services, and its magnificent 110-seat theatre with 16mm and video projection services as a meeting spot for audiences, Federal Government workers, and practically everyone involved in the arts in Halifax. Built in 1890-91, the four-story brick building at 1572 Barrington St. originally housed the Saint Mary’s Young Men’s Total Abstinence and Benevolent Society and then became a movie house in 1907 (as the Nickel Cinema). The balcony was retained, along with a regulation projection room with 8-inch concrete walls and an installed bathroom for the projectionist, all necessary from the days when nitrate films could not be left unattended for a second. In the late 1960s it became the home of the NFB in Atlantic Canada. The theatre was later turned over to Gordon Parsons, one of the founders of the Atlantic Filmmakers’s Co-op, to run as Wormwood’s Cinema. He was given free rent as long as one night a week or month he presented a program of NFB films, open to the public at no charge. As Parsons built up a viable film culture in Halifax, he expanded to 35mm, which was installed by the NFB, again at no charge. When he moved Wormwood’s two doors down to the Khyber building, the NFB space reverted back to 16mm and was run by David Middleton, with assistance from myself. The National Film Board building also housed, at one point, a lab that processed 16mm reversal film for television news broadcasts – replaced by videotape in the early 1980s – along with editing rooms, sound mixing facilities and a small studio. The Atlantic Film Festival, which began in St. John’s in 1980, was moved to Halifax shortly thereafter and housed in the NFB building, with the Board funding the festival and covering its shipping, communications, and other sundry costs, all part of the NFB’s mandate to help develop a national film culture. Since there were no film education programs in the province, the NFB used its 16mm collection to teach History of Film courses through the Nova Scotia College of Art and Design. I was the lecturer there for 15 years, often in collaboration with Terry Ryan and Bruce Barber. Barber and I leveraged the prestige of the NFB to create the Inter-University Film Minor. It remains a co-operative program that allows post-secondary students to do a minor in film by attending classes at Dalhousie, NSCAD University and St. Mary’s University. 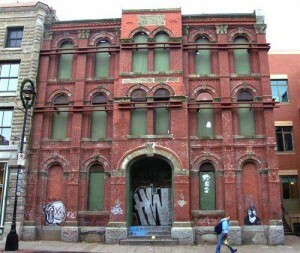 The front facade of the derelict historic NFB building on Barrington Street in 2004. The NFB building caught fire and burned almost completely in August, 1991. A new, smaller space was secured at the corner of Queen Street and Spring Garden Road in Halifax. Federal Government budget cuts, however, made the NFB unable to support the aims of a broader film culture including that of the Atlantic Film Festival. As the film scene on the East Coast grew, first with the establishment of Telefilm Canada and then with the Nova Scotia Film Development Corporation (which later became Film Nova Scotia and then Film and Creative Industries Nova Scotia, until it was closed down by the provincial Liberal government in April 2015), the role of the NFB retreated to that of a small but dedicated producer with a shrinking number of filmmaker support programs. The lingering role of developing media education and maintaining a film culture integrated with the rest of the country led to a pointed clash with a cabinet minister in John Savage’s Liberal provincial government in the 1990s. Guy Brown wanted to update the Maritime Film Classification Board, hoping to make it financially self-sufficient. I was the NFB Film Officer assigned to the file, and we had an interesting time trying to keep the old Censor Board from actually censoring anything. Eventually we won exemptions for the NFB, the Festival, the Dalhousie Art Gallery, and Wormwood’s. Alas, the Maritime Film Classification Board still exists, to no real purpose. Ask your MLA why.